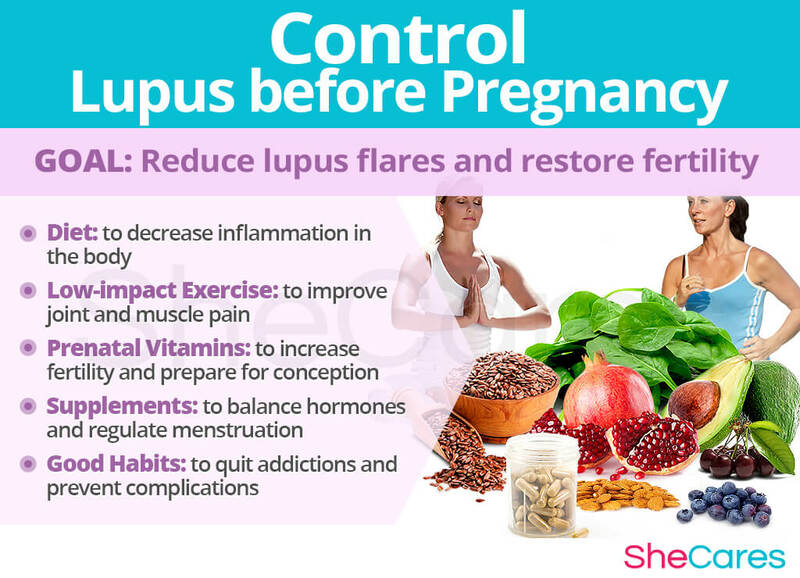 Up until recently, it was nearly impossible for women with lupus to have a healthy and successful pregnancy. 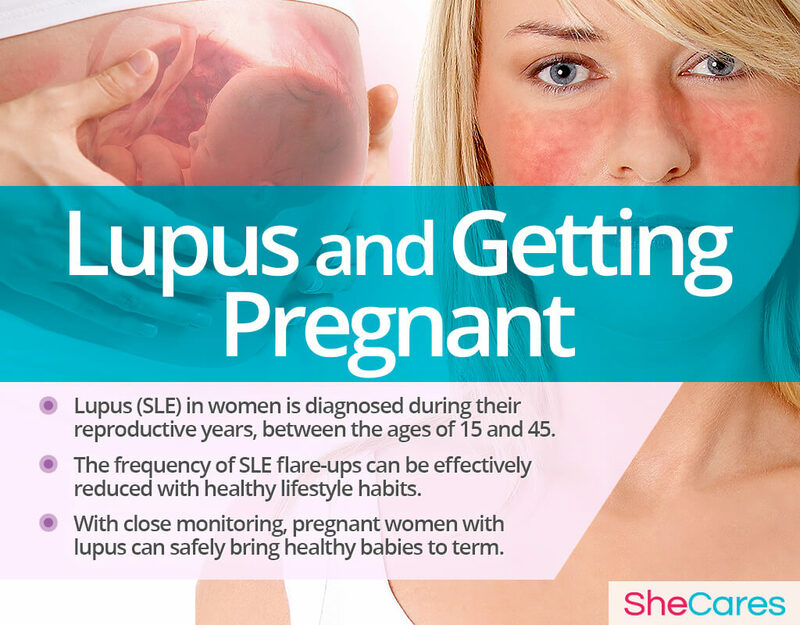 Conceiving and staying pregnant was challenging because lupus is most commonly diagnosed in women of childbearing age between 15 and 45, which comes with a range of risks and possible complications both for the mother and her baby. Fortunately, with proper care and monitoring, women with lupus can get pregnant and bring healthy babies to term without putting their own life at risk. Continue reading to see what useful and effective action steps could help you conceive and make your dream of becoming a mom a reality. Systemic lupus erythematosus (SLE), commonly shortened to lupus, is an autoimmune disease, during which the immune system mistakenly attacks healthy tissues in various parts of the body, causing a constant state of inflammation. The list of symptoms common to this disorder is wide and long as lupus can affect all organs and body systems, such as skin, joints, heart, and more. The progression of this disorder varies from woman to woman, but it is characterized by fluctuating states of flares (increased “disease activity”) and remissions (“disease inactivity”). As with other autoimmune diseases, the causes of lupus are not understood and might be rooted in genetics or environmental factors. Menstrual Disturbances. Active lupus might lead to irregular menstruation, including heavy bleeding or absence of a period, which may complicate conception. Reproductive System Dysfunction. Severely uncontrolled lupus might impair reproductive organs, thus preventing egg fertilization or implantation. Medication Side Effects. Certain lupus drugs might decrease libido and lead to premature ovarian failure (POF) and low ovarian reserve, both of which result in infertility. Psychological Factors. Lupus-induced emotional distress might decrease libido and sexual function. Other Associated Conditions, such as lupus nephritis or antiphospholipid antibody syndrome (APS), both of which might lead to infertility. It is important to note that a lupus-related pregnancy delay is ab important factor contributing to infertility since ovarian reserve depletes with age, lessening the chances of getting pregnant. 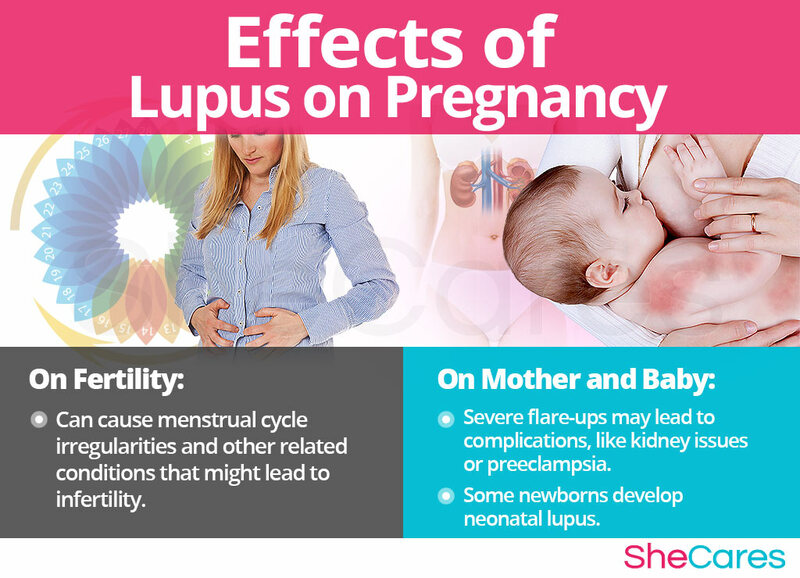 During pregnancy, most women experience frequent flares, which are periods when lupus is very active. Although a big portion of these occurrences is merely a nuisance, some might lead to more serious pregnancy complications. Moreover, three out of 100 infants of SLE mothers, who also have anti-Ro or anti-SSA antibodies, develop neonatal lupus. In most newborns, it disappears by the sixth month, but in some, it might lead to heart problems. Pregnancy might put significant stress on the body and can activate lupus, leading to a number of potentially dangerous complications, like lupus nephritis or preeclampsia. About 50% of women with SLE have antiphospholipid antibodies, called lupus anticoagulants, which increase the risk of premature birth (3 in 10 births), blood clots, miscarriage, or stillbirth. 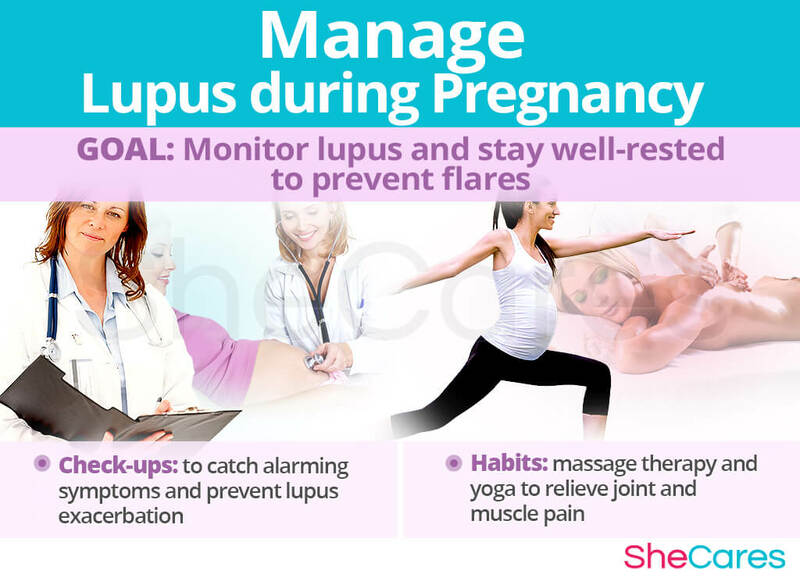 Although pregnancy with lupus is considered high-risk, careful monitoring can guarantee a safe and healthy pregnancy. Appropriate action plans should be supervised by a team of two specialists: a high-risk obstetrician and a rheumatologist, who specializes in autoimmune disorders. Anti-inflammatory and fertility-enhancing foods can not only boost your fertility, but will also keep your lupus in check by reducing inflammation, strengthening bones and muscles, and help you maintain a healthy weight. Prebiotic foods: vegetables (asparagus, spinach), fruits (prunes, pomegranate), and nuts and seeds (chia, almonds). Probiotic foods: fermented dairy (yogurt and kefir), fermented vegetables (sauerkraut, pickles), or kombucha. Antioxidants: blueberries, cherries, avocado, green tea, bone broth, or salmon. L-canavanine, an amino acid naturally present in alfalfa seeds and sprouts as well as several other legumes, has been shown to worsen SLE; therefore, it is best to be avoided. Regular exercise can help you prevent lupus flares by improving flexibility, joint pain, and preventing weight gain. Exercise for at least 150 minutes a week and avoid strenuous exercises. If you suffer from lupus-induced fatigue, focus on low-impact activities that do not put stress on your bones and joints, such as swimming, biking, or walking. Prenatal vitamins, like folic acid or iron, can optimize your chances of conceiving as well as prevent birth defects and other pregnancy-related complications. Learn more about prenatal vitamins. Hormone-regulating supplements, such as Macafem, can regulate your menstruation and boost your fertility. Other supplements, such as Omega-3s fatty acids, DHEA, or MSM have also been shown to improve fertility, relieve lupus-induced joint and muscle pain, and reduce inflammation. Review your medications and supplements with your doctor to ensure they can be continued during pregnancy. Quit smoking, alcohol, and illegal drugs as it can increase inflammation and tissue damage. Try natural therapies, like yoga, Tai chi, or acupuncture, to relieve stress as its build-up might diminish your fertility. Try to stay well-rested and stress-free by sleeping seven to eight hours a day and cutting down on caffeinated beverages. Keep away from direct sunlight as it can activate lupus and trigger its symptoms. Wear sunscreen with an SPF of 50+ when outdoors. Fuel up on ovulation foods, such as nuts, plant proteins, and full-fat dairy. Drink plenty of water, which aids in hormonal transport and makes cervical mucus more sperm-friendly. Maintain frequent doctor's check-ups to prevent potential complications. Try prenatal yoga or massage to reduce the burden pregnancy exerts on your body and prevent flares. 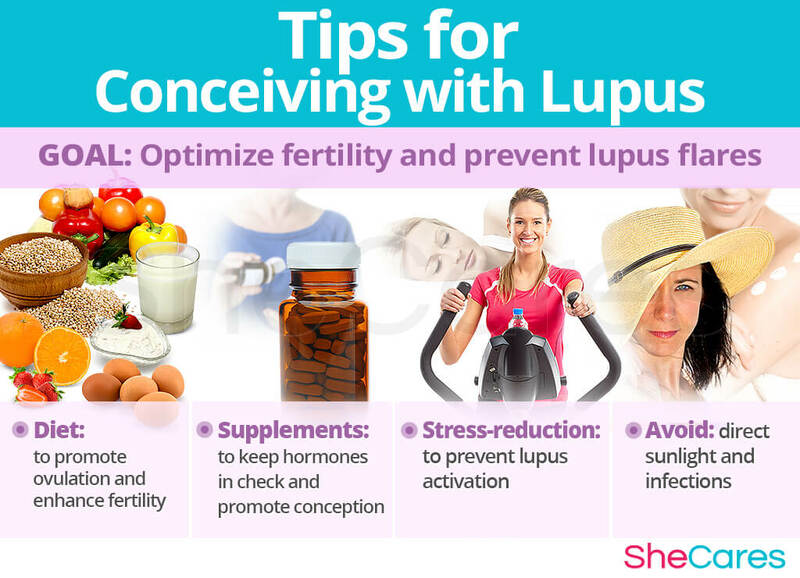 Although lupus can be a debilitating condition with numerous challenges during conception and pregnancy, most women have a successful pregnancy and healthy babies. Careful pre-conception planning and healthy practices, such keeping an anti-inflammatory diet, taking supplements, like Macafem, and exercising regularly, can greatly improve your chances of staying healthy as you give life to your baby.